The Funky Felter: Building a homemade light box for my felted creations with a little PVC pipe, some cotton material, and help from one crafty dad! Building a homemade light box for my felted creations with a little PVC pipe, some cotton material, and help from one crafty dad! A few months ago, one of my fellow local Etsy sellers, Nicole of Ni-Chern Designs, posted to our Kansas City Etsy Street Team forum about having a group light box build at her home. At the time I was unable to attend, but I really, really wanted to have my own light box to take photos. Nicole posted links to a couple of different tutorials for building a light box using PVC pipe as the shell or base. You can find the instructions here and here. Also, if you search the web for "home made light box", you will find many more tutorials out there. I suggest that you pick one that you like and can understand well, then go from there which is what I did. Since I am not that savvy at building dimensions, I printed out a copy of some online light box tutorials and handed them over to my dad. The original light box size was much too small to fit my larger creations so my crafty dad did a little figuring to size the dimensions up for me. My light box ended up being approximately 40 inches wide X 32 inches high X 26 inches deep. Unfortunately, it makes my head spin a bit to think about adapting the original light box dimensions so you are on your own if you need to scale the PVC pipe up or down from the original plans. Hopefully, you or someone dear to you is savvy at building dimensions. My dad quickly finished building a much larger version of the basic PVC pipe shell as seen in the original plans. He left it unglued so that it could be taken apart and reassembled if necessary. After the basic PVC pipe shell was built by my crafty dad, I took over with the finishing touches. First I placed the shell of the light box on an old kitchen table that I use in my basement studio and braced the legs to the table using a bit of sticky tac on their bottoms. (Since it was so large, it was going to have to be a stationary setup in by basement studio.) Then, I bought three yards of inexpensive white cotton material to cover for the top and two sides of the light box. I also purchased two yards of cotton material to use as the background which covers the back of the light box and drapes down on the table top. This material can be any color you want for your background. The lighting was obtained from a hardware store. They are simply three inexpensive workman's lamps with 100 watt bulbs placed in them. It is good to have lighting from at least three light sources to avoid shadows. You may need to adjust the angle and placement of your light sources as well as the wattage of the bulbs. This will all depend on your own light box location and setting. As far as your photo results are concerned, you may still need to edit them slightly in a photo editing software like Photoshop. Even with my great new light box setup, I have found that I still have to tweak the photos a bit to get them just right, but I am a trained graphic designer and very picky at times about this kind of thing. You can see a examples of my latest light box photos in this post along with a photo of my actual light box. For more photos of the light box and example shots taken using it, please visit my flickr account. 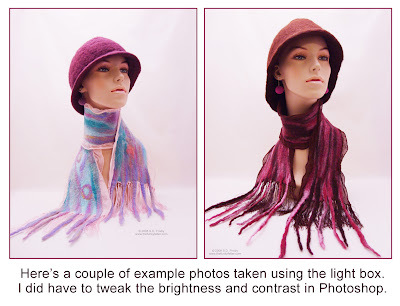 I hope this information is helpful to you in your crafty endeavors and photographing them! Thanks for the post! It's weird because I was just thinking of how to let other's see the lightbox I made from a large box! I know others will appreciate seeing how something so simple can have such dramatic results! This is a wonderful post. We've been talking about it, the feltiers I hang with, for some time. Thanks so much for the details. Fiber is sometimes hard to photograph, as evidenced in my photos, and this will help a great deal.